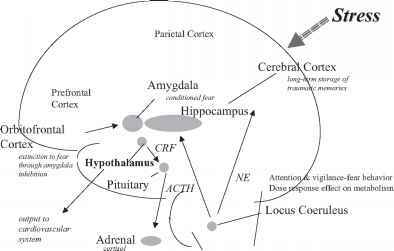 Event-related potentials (ERPs) are an index of central nervous system (CNS) functioning thought to reflect the underlying processing of discrete stimuli (Hillyard & Picton, 1987). ERPs are scalp-derived changes in brain electrical activity over time, obtained by averaging time-locked segments of the electroencephalogram (EEG) that are synchronized to the presentation of a stimulus (Donchin, Karis, Bashore, Coles, & Gratton, 1986). In general, the physical basis of the ERP signal derives from transient changes in electrical activity occurring in the brain, and reflects the summation of excitatory and inhibitory postsynaptic potentials (EPSPs and IPSPs) across large numbers of synchronously firing neurons (Allison, Woods, & McCarthy, 1986). The primary neural generators of the postsynaptic potentials underlying the ERP signal are believed to be pyramidal cells in the cerebral cortex. Among the most common neurons in the cortex and named for their relatively large (10 to 70 ^m in diameter), pyramid-shaped cell bodies, they have a single prominent apical dendrite, small basal den-drites, and a lone basal axon (Pritchard & Alloway, 1999). Pyramidal cells are located primarily in Layer III (the external pyramidal layer) and Layer V (the internal pyramidal layer) of the cortex, with some pyramidal cells, projecting to the thalamus, residing in Layer VI (the multiform layer). The single apical dendrite of the pyramidal cell arborizes through more superficial cortical layers (i.e., those closer to the cortical surface, signified by lower numerical designations, e.g., Layers I, II), while the short basal dendrites ramify within deeper cortical layers. The basal axon may ramify locally within the cortical layer, or may project to remote cortical and even subcortical targets (Pritchard & Alloway, 1999). Pyramidal cells are often characterized as the efferent neurons of the cerebral cortex, with the medium and large pyramidal cells in Layer V making up its primary output layer. It is generally agreed that action potentials are not the source of electrical activity reflected by ERPs. Action potentials are discrete voltage spikes that travel along the axon until the potential reaches an axon terminal. Action potentials occur relatively quickly (1 to 2 ms), and more importantly, the highly asynchronous nature of action potentials across groups of neurons tends to cancel out the voltage produced, and thus makes detection of voltage from action potentials at the scalp virtually impossible. In fact, the only way to record action potentials from a large number of neurons is to place an electrode very near the cell bodies (i.e., intracranially). Rather, electrical activity detected at the scalp that is represented by ERPs originates from the summation of extracellular changes in ion concentrations that result from chemically mediated EPSPs and IPSPs, occurring across large groups of thousands or even millions of neurons. Postsynaptic potentials typically have a duration of 10 to 250 ms (da Silva & van Rotterdam, 1982) and involve the movement of potassium, sodium, and chloride across the neurocellular membrane. The probable sequence of specific events is as follows: In the case of an EPSP, an excitatory neu-rotransmitter is released at the apical dendrite of a cortical pyramidal cell. Subsequently, an electrical current will flow from the extracellular space into the cell, resulting in a net negativity (or negative charge) outside of the cell in the region immediately surrounding the apical dendrite. To complete the process, current will also flow out of the cell body and basal dendrites, yielding a net positive charge in this area. This co-occurrence of discrete areas of negative and positive charge in extracellular space, separated by a small distance, creates what is termed a dipole. A single dipole associated with a single neuron would not be detectable from an electrode placed on the scalp. In order for this process to be detected as voltage at the scalp, the summated dipoles from thousands or millions of neurons must occur at approximately the same time, and the dipoles from individual neurons must be spatially aligned. Fortunately, large populations of pyramidal cells in the cortex are indeed aligned parallel to one another (and perpendicular to the scalp). Thus, the synchronous activation and parallel spatial arrangement of cortical pyramidal cells results in the summation of many dipoles, and the subsequent current moves through the extracellular space between the surface of the cortex and the skull, finally reaching the surface of the scalp, and the experimenter's waiting electrode, by volume conduction. 1. A technically detailed description of the neural origins of ERPs is beyond the scope of this chapter. The interested reader is referred to Nelson & Monk (2001) and Luck (2005) for excellent, in-depth discussion of the neural bases of ERPs.